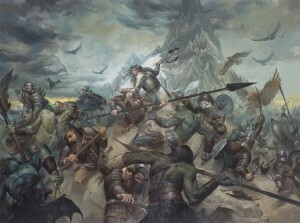 The cover art of The Battle of Five Armies, "The Last Stand of Thorin Oakenshield", by Lucas Graciano, was the winner of the Chesley Award as Best Gaming-Related Illustration. 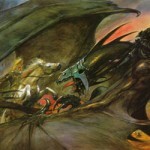 The Chesley Awards have been bestowed by the Association of Science Fiction and Fantasy Artists (ASFA) at LonCon3, 72nd World SF Convention, together with the famous Hugo literary awards. Chesley Awards recognize individual artistic works and achievements in eleven categories. "I felt deeply honored to have the artwork win. All of the other nominees are amazing artists and the works they had in the category were great. I was humbled and happy to stand with such great talent," said Graciano. In an article posted to his blog in January, talking about the making-of of the illustration for The Battle of Five Armies, Graciano wrote that one of his first illustrative drawings, when he started attending art school was the iconic scene of The Battle of Five Armies from the book The Hobbit. "It was a decent effort, but an ambitious image to tackle, especially for a new art student. I had always wanted to illustrate the scene again at some point. So, when Ares Games emailed asking me to illustrate their The Battle of Five Armies board game cover, I jumped to the opportunity (...) The subject was something I've always had a strong passion towards. I would have been a fool not to take the opportunity to do it. Plus, I wanted to get this out before Peter Jackson put the visual out there that will forever be in people's minds! ", he explained. 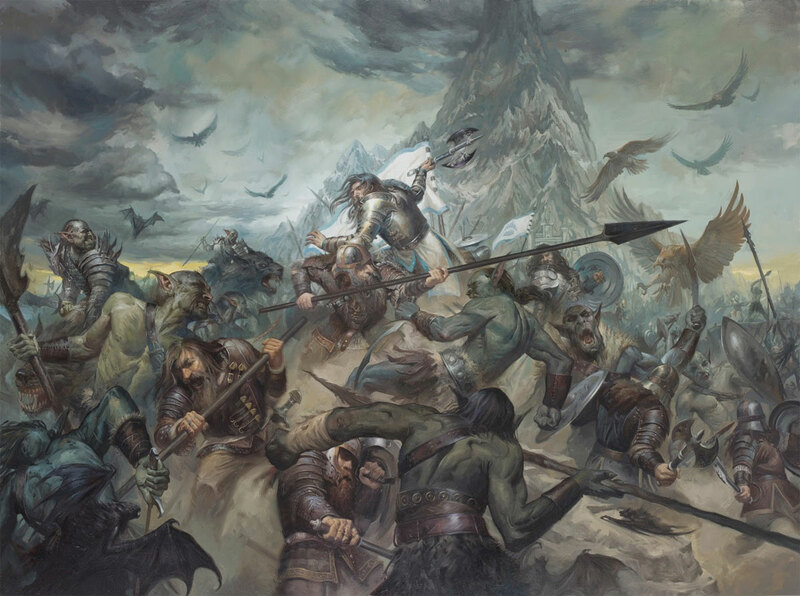 "The Last Stand of Thorin Oakenshield", cover art of The Battle of Five Armies. 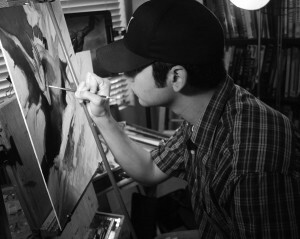 Lucas Graciano started his career as a caricature artist. He later worked in the video game industry as a visual development artist, and then teaching at Watts' Atelier of the Arts. He now works as a freelance artist focusing primarily on fantasy illustration, doing book covers, card art, and other promotional works. 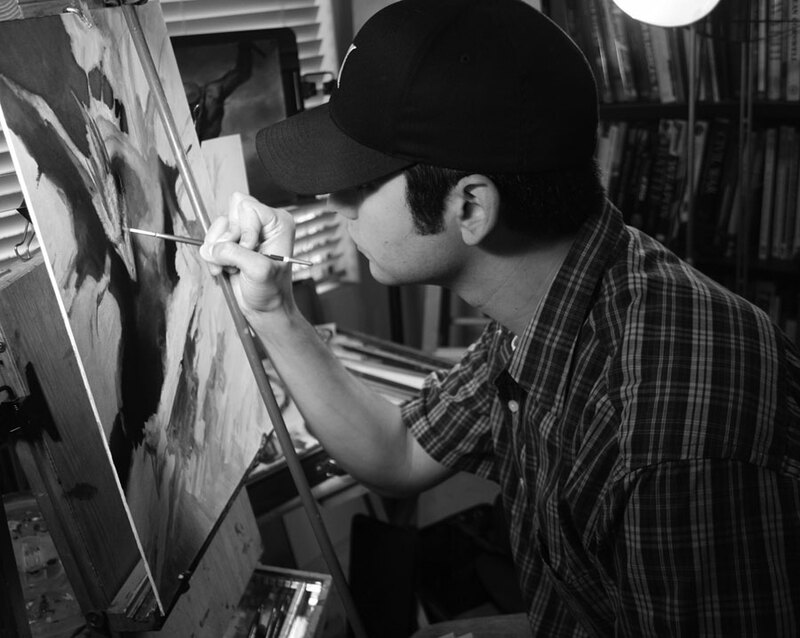 He received numerous awards, including two Chesley Awards for Best Gaming-Related Art, in 2009 and 2010, the 2013 Silver Award for Spectrum’s Institutional Category, and an Honorable Mention in the Art Renewal Center’s 2013 Imaginative Realism category. To see more of Lucas Graciano's works, visit his website: www.lucasgraciano.com and his blog www.lucasgraciano.blogspot.com.